Associate professor Pavel Postnikov in the lab. Courtesy of Tomsk Polytechnic University. The sensor was made from a multilayer material based on a thin gold film about 1 x 0.5 cm in size and functionalized with diethylenetriaminepentaacetic acid (DTPA). The periodical gold structure was created using an excimer laser beam treatment of the polymer surface followed by additional gold coating. DTPA molecules were attached to the gold surface of the sensor. Grafted DTPA molecules showed high SERS response, due to the surface plasma polariton (SPP) excitation and propagation on the gold grafting. A homogenous distribution of the plasmon intensity on the ordered plasmon structure and the high affinity of DTPA to heavy metal ions enabled efficient entrapment and selective and sensitive detection of heavy metal ions. Efficient chelating of heavy metal ions by the DTPA molecules from solution resulted in pronounced changes in their SERS response. The shift of carbonyl Raman peak position was found to be dependent on the atomic number of heavy metal ions, enabling selective detection even in a mixture of a few metals. 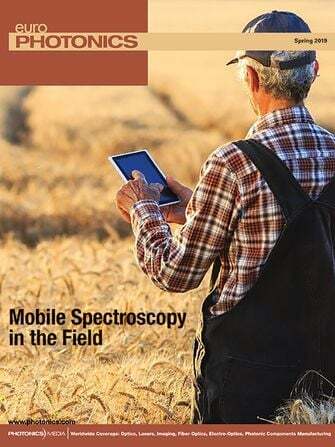 The SERS platform was combined with a portable Raman spectrophotometer to create a portable SERS-based spectrophotometer relatively quickly and at minimal cost. “In the study we demonstrate [the] possibility of creating such chemical sensors," said associate professor Pavel Postnikov of Tomsk Polytechnic University. "The novelty is that we combined both chemical and physical methods. Our colleagues in Prague (University of Chemistry and Technology) prepared substrates by physical methods and we modified organic compounds using chemical methods. Due to this combination, we eventually got the opportunity to detect heavy metals at ultralow concentrations. "We can monitor trace concentrations of substances. Thus, the sensitivity of sensors for dyes reaches 10-16 mol and for heavy metals it is about 10-14 mol,” Postnikov said. In the long term, these sensors could be used to monitor liquids in food technology, medicine and environmental studies. “It takes several minutes to carry out this analysis. Therefore, it can be used on site — for example, one may take samples from the reservoirs and receive an immediate result that would show if there are any toxic substances present in the water, even at ultralow concentrations,” said Postnikov. The research was published in Sensors and Actuators B: Chemical (doi:10.1016/j.snb.2017.07.018).